McGwire is clearly one of the richest colored full Accoyo males in the United States. 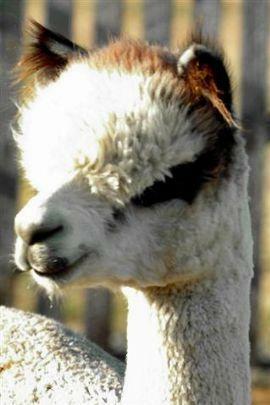 Sired by Accoyo Victor, whose fleece and offspring are Legendary, he glows like a light is shining from inside his fleece. His density and staple length pull together for some of the most magnificent fleece weights on record (14.5 lbs--he is shorn every six months now). At age six, his CV is 16.2, micron 24 with an absence of guard hair. 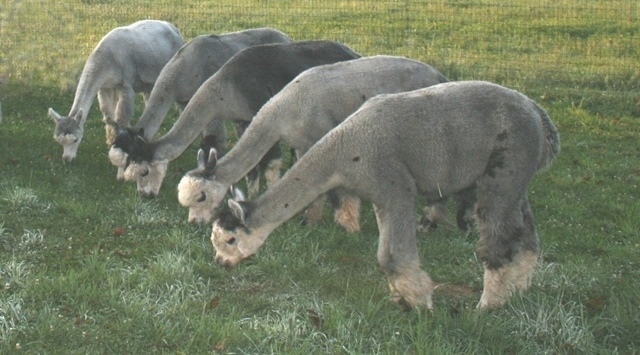 With over 30 cria, he is throwing silver and rose grey out of solid dams, many black cria, and often darkens the dams color. 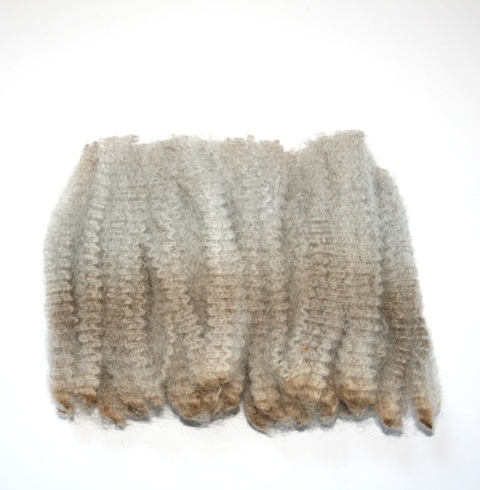 The crimp, bundling and shine is profound. Contact us for his traveling schedule, and book a breeding to McGwire today! Carmen Cloud is the best producing female on our farm. She is well built with a beautiful head and topknot. 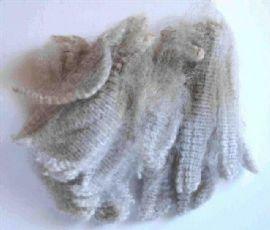 Her fiber continues to be dense, soft and crimpy with a luscious handle which she passes on to her cria. Although she is listed as dark brown the silver grey almost always comes through to her offspring, especially when put with silver. Her father, Mr.Know It All(BG) was at one time the highest selling male in the country. He has many beautiful offspring on the ground with Carmen being one of the best! 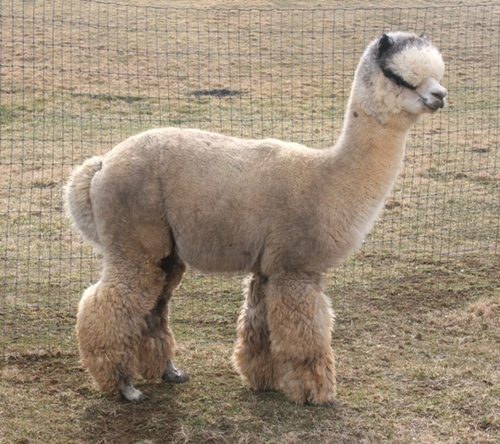 Her dam, Camana's Snowy River(Gracie)(LSG) is a beautiful silver grey import that has been the backbone of our grey program since we began raising alpacas. Carmen was Gracie's first cria. Carmen Cloud has had a history of producing multi-ribbon winners and champions including: Kahuna Cloud, Mirra Cloud, Calypso Cloud, and of course Orlando Cloud. Some of her many brothers and sisters include national color champ Rincon Cloud, Leila Cloud, Stella Cloud, and Maurice Cloud. 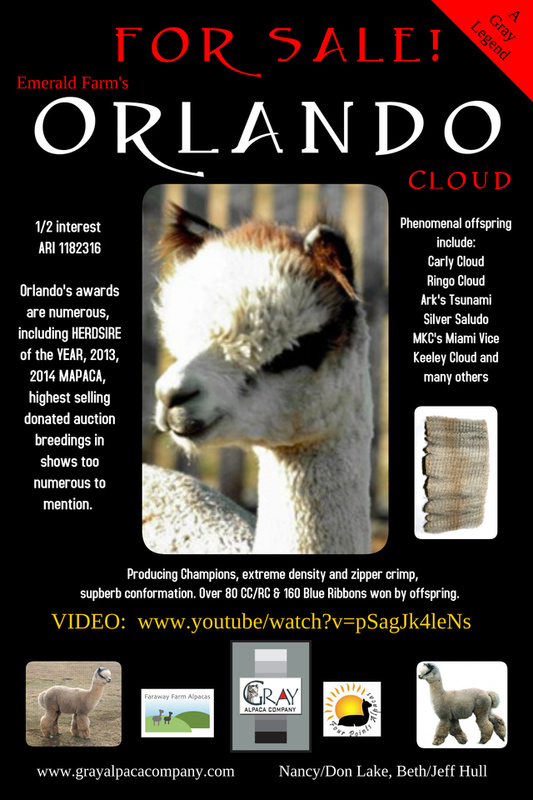 Orlando Cloud is a stunning male who has without a doubt helped boost the quality of gray huacayas to new heights. So often a male shines for a few years, and then is overtaken by higher quality. Not so with Orlando. In 2008 his offspring began winning top honors, and since then at almost every large show his offspring, and now grand kids and great grand kids, continue to bring home banners and blues. Gray Alpaca Co. recently had four Orlando offspring in a row, and this group is simply outstanding. We can't wait to see them in the show ring. At the October Empire Extravaganza in Syracuse, NY, his offspring won two CHAMPIONSHIPS, including Gray Championship in fleece, and a RESERVE CHAMPIONSHIP, along with 4 Blue Ribbons. He continues to stamp out high quality crias. Orlando's accomplishments are many, and he was named HERDSIRE OF THE YEAR 2013, and 2014. This award is based on the number of points accrued by winning offspring at MAPACA, to date the largest show in 2013. 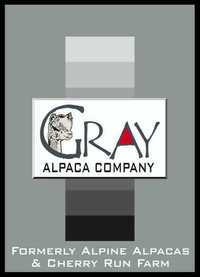 Here is the new standard for gray! Orlando stands above the rest with his consistent, dense architecture from his tail to his topknot. The judges have raved about this male from the time he hit the show circuit, and his offspring are now following in his footsteps with multiple Championships and Reserve Championships. 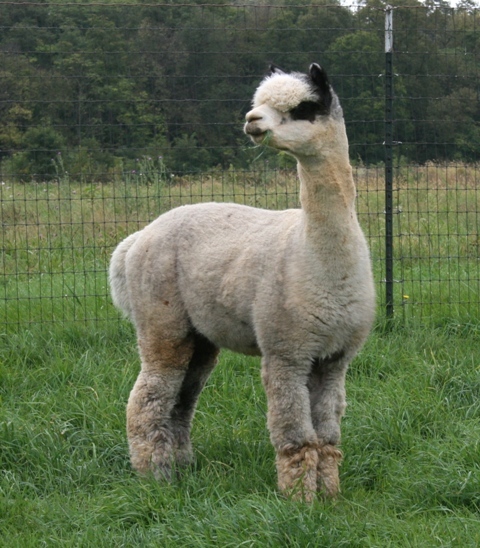 When bred to gray or black his cria's colors have been primarily gray, and he has also shown the ability to throw gray out of fawn. Orlando's stud fee is $5,000, with generous discounts for drive by breedings. For details please contact Nancy at nlake@grayalpacacompany.com or Jeff at jeff@bjsembroidery.com. Orlando offspring were first shown in 2008, and to date they have won over 80 Color Championships/ Reserve Championships, and over 160 Blue Ribbons! Co-owned with our friends at Faraway Farm and Four Points Alpacas. We offer flexible financing and can accommodate individual needs. 2x Color Champion - SOLD! Orlando Girl! Comes with breeding.